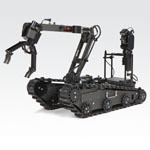 Allen Vanguard’s Defender and Digital Vanguard bomb disposal robots are operated by the new 2G Command Console Kit - the most versatile, safe and ‘future proof’ robot control system for EOD, IEDD and Tactical Remotely Operated Vehicles (ROVs). The 2G is capable of commanding multiple digitally controlled ROVs during the same mission. 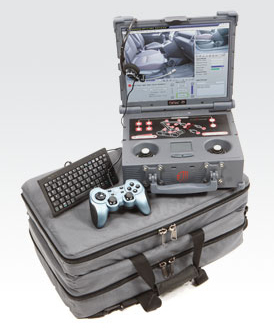 This digital ROV command console effectively sets a new industry standard for bomb disposal ROV mission flexibility and simplicity to address current and future EOD/IEDD operational requirements. Bomb disposal technicians appreciate the 2G’s small size and rugged design, making it both lightweight and portable. 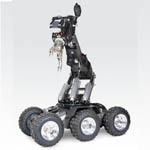 Its robust safety systems and compatibility with commercial sensors provide reliability and operational readiness for bomb disposal. The 2G command system’s future proof design is expandable, easy to use and allows the integration of the ROV with a wide range of digitally controlled accessories such as portable x-ray systems, chemical detection monitors and ECM unit. Digital Vanguard ROV from Allen-Vanguard Corporation.